Last week, I confessed that I'm a new convert to scones. In my excitement, I took it one step further—savory scones! In The Diva Serves High Tea, a gentleman takes tea every day at the local tea room because "he's particular fond of the bacon cheddar scones." I have to admit, I'm particular fond of them myself. They can be served at tea as a savory before the sweets. I have also served them at brunch. So far, everyone has liked them. They're a nice switch from bread. You can serve them plain or with Maple Bourbon Butter if you want to kick things up a notch. I especially love that they can be frozen and baked fresh when you need them. The pieces are large, so don't be afraid to cut them in half if you have a crowd. I've been pulling them out as needed and baking just a couple when we have a yen for them. 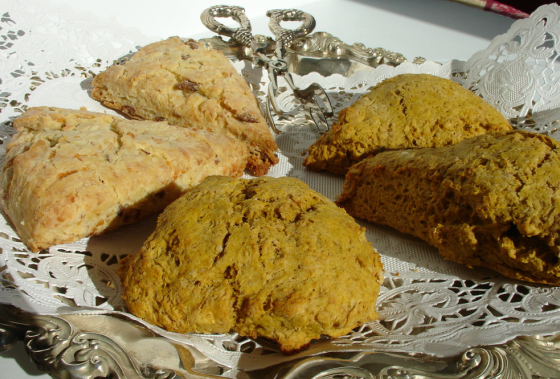 By the way, in the photo above, the dark scones are pumpkin. That recipe will be coming in the fall. The lighter ones on the left are bacon cheddar.